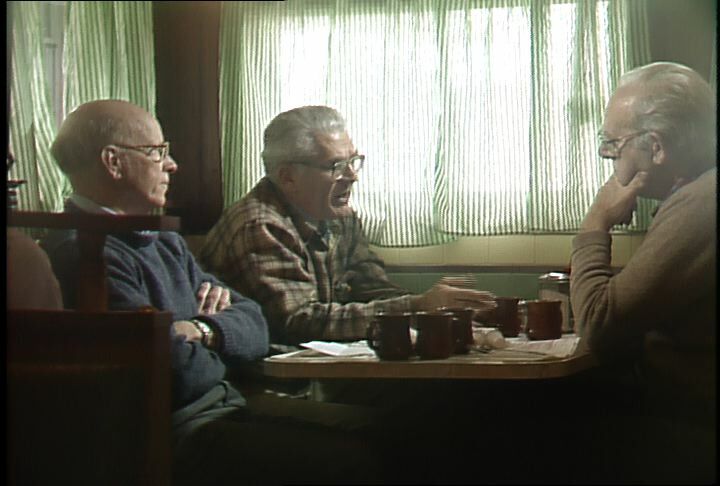 Three men sit in the Peterborough Diner and discuss their memories and opinions of the local beginning of the Nuclear Freeze Movement in small town New Hampshire. Chicago: “War and Peace in the Nuclear Age; Peterborough Citizens Remember the Beginning of the Nuclear Freeze Movement,” 11/11/1987, WGBH Media Library & Archives, accessed April 25, 2019, http://openvault.wgbh.org/catalog/V_CCA91C5574984805A0D0A8E63E78B785. MLA: “War and Peace in the Nuclear Age; Peterborough Citizens Remember the Beginning of the Nuclear Freeze Movement.” 11/11/1987. WGBH Media Library & Archives. Web. April 25, 2019. <http://openvault.wgbh.org/catalog/V_CCA91C5574984805A0D0A8E63E78B785>.